Aone doesn’t use silicon or goretex, we only use autologous. Most widely commonly used implant for rhinoplasty is silicon and goretex. Aone only use autologous without using silicon. Nasal septal cartilage is used for nasal tip. Diced cartilage is wrapped in fascia for dorsum augmentation. 01.Nasal projection on profile view : It should be balanced with rest of the face. 03.Deviation : It shouldn’t be deviated. 04.Height of forehead : Forehead looks lower with dorsum augmentation. 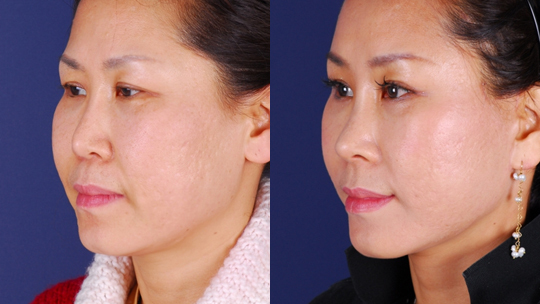 Fat grafting is necessary to increase volume for forehead. Implants or autologous tissue is used for dorsum augmentation. Aone uses autologous for dorsum implant. For mild elevation (under 2mm ) temperal fascia is used. 01.Implants shows through since skin gets thinner with age. 02.Foreign body could occur complication. 02.Patients can have better eye expression. 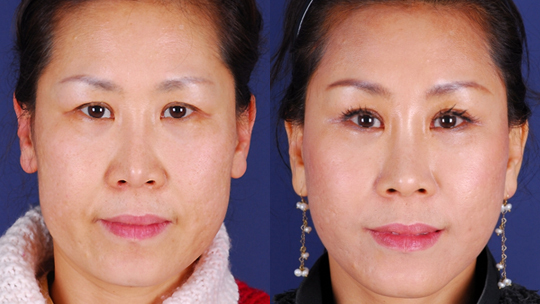 03.Forehead and malar looks lower with dorsum augmentation. Diced cartilage wrapped in fascia is inserted in nasal dorsum. Dorsum is augmented partially such as between nose or right above nasal tip. It is mostly performed on Pseudo-hump nose.